LOT Polish Airlines' plan to more than double passenger numbers to 10 million in 2020 will bring significant growth to its base airport, Warsaw Chopin. LOT's aspirations to be the hub carrier for the "New Europe" will elevate Chopin airport to competing with Budapest, Prague and Vienna to be a hub for Central Europe. LOT's growth is important to Warsaw Chopin, but is not the sole story. Chopin grew traffic while LOT restructured, while passenger numbers declined and then stayed flat. Second largest carrier Wizz Air is growing its presence and could introduce connections. 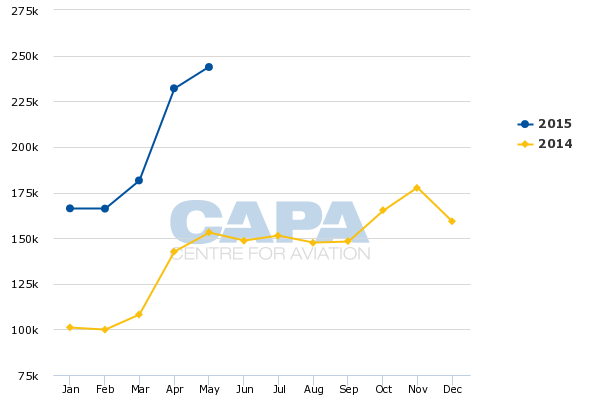 Ryanair meanwhile is at Warsaw's LCC airport, Modlin, contributing 60% growth in the first five months of 2015. Although Warsaw Chopin finished an expansion programme in May-2015, further works are needed to support LOT's growth, especially with widebodies. Emirates will up-gauge its existing daily service before presumably later considering a second daily flight. The bigger challenge to LOT and Warsaw is Lufthansa and its German hubs, which have grown as LOT shrank, especially in secondary Polish cities. Chopin, the main airport serving Warsaw, is finally on a growth streak. The 9.5 million passengers it carried in 2008 was not surpassed until 2012 as traffic dipped in 2009, 2010 and 2011. 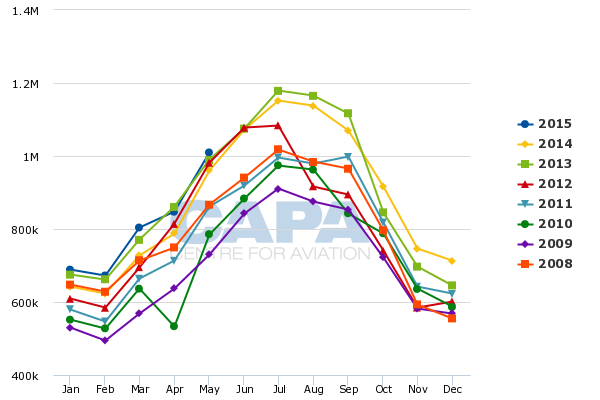 2013 brought a new peak (despite Ryanair's switch to Warsaw's other airport) but traffic dipped slightly in 2014. Over 11 million passengers are expected in 2015, setting a new record. 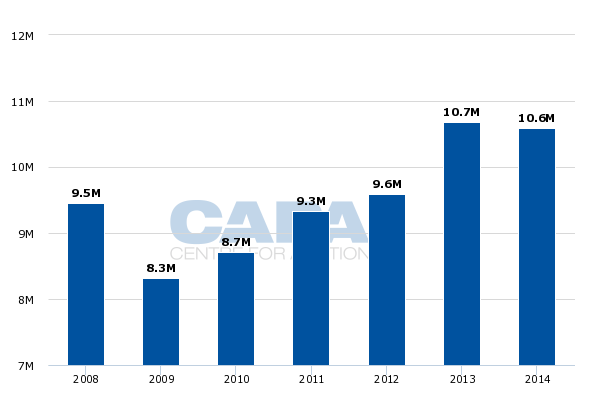 This growth is due to carriers other than Warsaw-based LOT, which is unable to grow until 2016 due to EU compensatory measures for receiving state aid. There is in fact only a limited correlation between Warsaw and LOT's passenger figures. 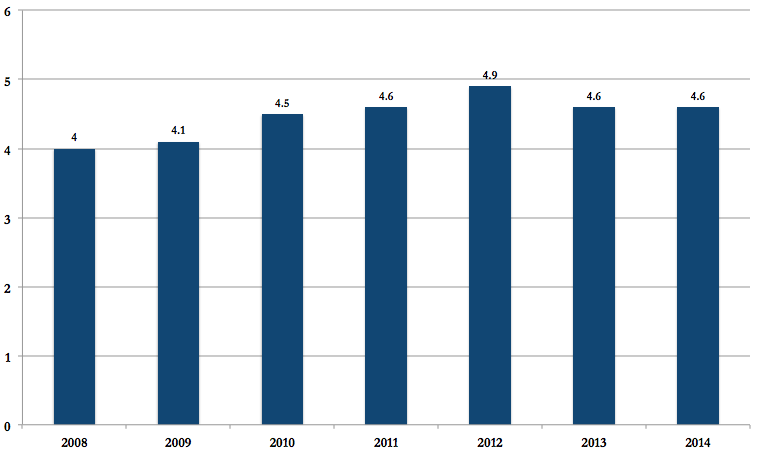 LOT's traffic climbed between 2008 and 2012 whereas Warsaw saw a dip between 2008 and 2012. (LOT's figures include passengers who did not travel to/from Warsaw.) LOT's passenger volumes dipped in 2013, but in this same year Warsaw's overall throughput increased. Warsaw has achieved 7.5% growth in the first five months of 2015. If growth continues at this rate, Warsaw will easily meet its objective of surpassing 11 million passengers in 2015. LOT in Jun-2015 announced its new strategic plan that will have it double in size by 2020, including 30% growth in 2016 when compared to 2014 levels. Passengers numbers are forecast to grow 2.2 times over to 10m in 2020 while ASKs are forecast to grow 2.9 times, reflecting LOT's introduction of new long-haul services: Bangkok, Seoul and Tokyo. Two more points will be announced later in 2015 supplementing existing Beijing, Chicago, New York and Toronto services. LOT aims to have 10-12 long-haul points in 2020, implying about one long-haul route announcement per year on average. LOT is also starting service to new European points and also resuming discontinued service. LOT's growth is designed to allow it to serve a wider market than it does today. LOT calls its catchment area the "New Europe", which broadly comprises areas including Eastern Europe and former Soviet states. Transfer traffic already accounts for 41% of LOT's traffic and the airline expects this to increase to about 50%. Warsaw airport achieves about 45% transfer traffic, slightly ahead of LOT's share. LOT accounts for about half of the airport's seat capacity. Notable transfer traffic is brought from Lufthansa, Turkish and Aeroflot, all mostly transferring passengers to LOT. 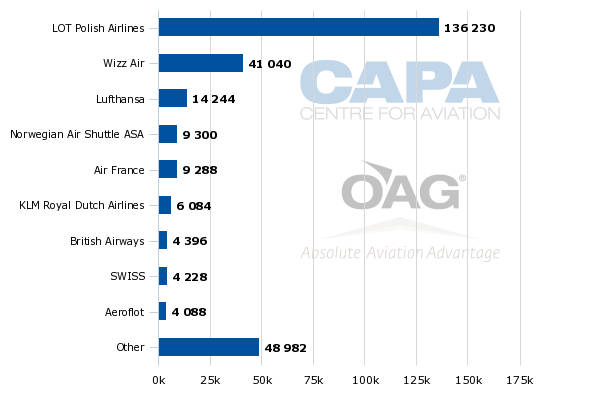 Lufthansa is the third largest carrier (by some distance) at Warsaw while Aeroflot is ninth largest. Warsaw expects its overall transfer traffic to exceed 50%, although it is unlikely to exceed two thirds. Second largest carrier Wizz Air has four aircraft based at Warsaw with a fifth to join in 2016. Warsaw also hopes that Wizz will start formal connections, as other LCCS have done. This would further boost transfer volumes. Warsaw Chopin puts its short haul-to-short haul minimum connection time at 30 minutes. Transferring to/from long haul this bceomes 40 minutes but Warsaw expects to bring it down to 30 minutes as well, giving Warsaw one of the most competitive connecting times. Warsaw guarantees airlines that passengers will not spend more than 10 minutes in security. Warsaw Chopin Airport: a hub for Central/Eastern Europe? 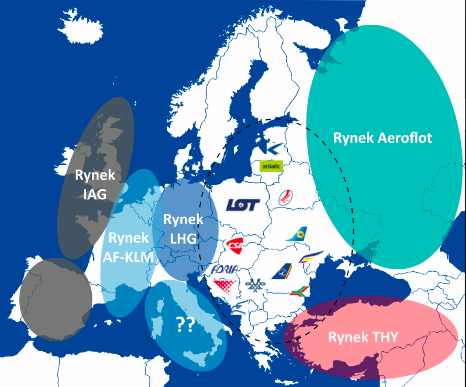 LOT considers the "new Europe" is lacking a hub airport and hub carrier, a void it aims to fill with Warsaw. Warsaw is the only airport in the immediate region with over 1,000 long-haul movements a year. Vienna and Helsinki are competitors, as are Istanbul and Frankfurt. LOT expects its growth to make it comparable to Aer Lingus, Austrian, Finnair and TAP. So how does LOT's hub at Warsaw compare to the local hubs of those airports? Warsaw in 2014 was two thirds the size of Helsinki and half that of Dublin and Vienna. A more relevant comparison is how Warsaw is developing as a hub for the region. Warsaw has lagged behind Prague. 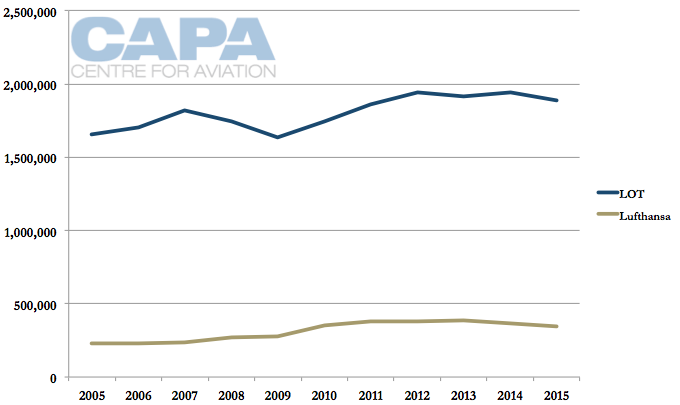 Both saw passenger volumes dip in 2009. Warsaw recovered in 2011 but Prague only partially bounced back. Since then its traffic has further dipped while Warsaw's has grown. In 2013, Prague was only 2.6% larger than Warsaw, and in 2014 5.0% larger. Warsaw in coming years will benefit from LOT's strong growth regionally and long-haul. 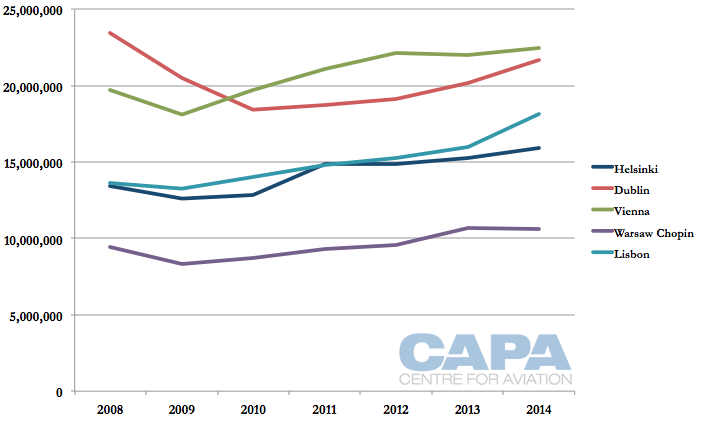 In comparison, Prague's home carrier Czech Airlines does not have as ambitious growth plans. Czech Airlines' only long-haul route is to Seoul Incheon. That makes Prague dependent on foreign carriers. Its latest addition will be Hainan Airlines with a service from Beijing. Belgrade and a resurgent Air Serbia also have hub ambitious. Air Serbia is evaluating service to North America. It is quickly catching up to Riga, but both are less than half the size of Prague and Warsaw. Even with forecast record traffic over 11m in 2015, this is still well short of Warsaw's 22m design capacity. However, there is increasingly congestion and securing peak hour slots, especially in the morning and evening, can be difficult. These peaks are when LOT is most likely going to want to put in growth in order to strengthen connections. 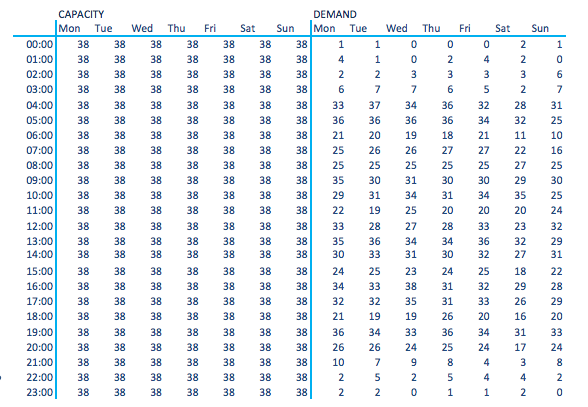 Airport Coordination Limited has set hourly movements on runways to a cap of 38, and a number of periods see airline demand approach this limit; allocated slots (different from the demand shown below) spread the services out. Due to noise concerns, Warsaw is capped at 600 movements a day, including initially 40 at night (20:00-06:00). The night cap has been slightly revised upwards, but night movement demand still exceeds capacity. The airport expects to be able to work with authorities to increase the limit to upwards of 800 movements a day. Growth can often be a good problem, and this is the case at Warsaw where LOT plans to operate 14-16 widebody aircraft by 2020, up from its present six 787-8s with a further two on order. LOT is considering more 787s or A330neos. 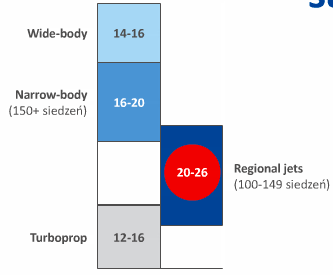 Warsaw can handle up to eight widebody aircraft at one time, but only some of these can be code E aircraft, which the 787 and A330 are categorised under. Warsaw plans to modify six code D stands to code E and construct six all-new code E stands. These 12 code E stands will join two existing code E non-Schengen stands for a total of 14. In Mar-2015, Polish Airports, the operator of Warsaw International Airport, reported that it plans to invest PLN800 million (EUR192.2 million/USD202.6 million) by 2016 in the extension of the passenger terminal, modernisation and redevelopment of apron parking areas and completion of the construction of a five-star airport hotel. In Feb-2015, the airport operator signed a contract with Pekao SA bank for emission of bonds worth PLN600 million (EUR144 million). LOT's existing long-haul network is mostly to North America, and while there will be some additional growth there, the focus is on Asia. This places LOT – and its Warsaw hub – in competition with Gulf carriers. For Warsaw-Asia traffic, Qatar Airways has a small presence with a daily A320 service and Emirates daily with an A330-200, moving to 777-300ER by the end of 2015. Etihad does not serve Warsaw, likely preferring to use equity partner airberlin from its German hubs. Air Serbia provides limited connections to Warsaw over Belgrade. Outside Poland, LOT will compete with the three Gulf carriers – and others – for one-stop service to Asia from the "new Europe". 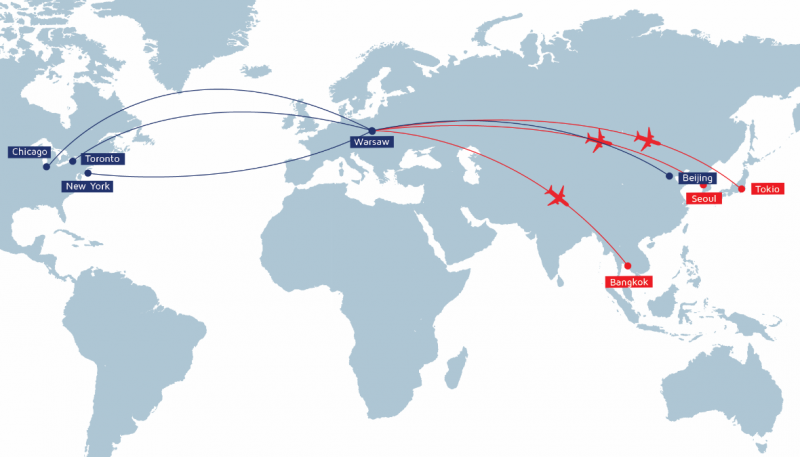 European carriers will be better placed for Northeast Asian traffic, as connections via the Gulf are more circuitous than transiting through the Gulf to serve Southeast Asia. LOT's existing Asian destination of Beijing will be joined by Seoul and Tokyo, also in Northeast Asia and somewhat isolated from Gulf carriers. However, LOT's seasonal destination of Bangkok is a competitive Gulf market. So too is Singapore, which would logically be in LOT's network assessment. Turkish Airlines, another competitor for these operations, has an extensive European network but its Asian network is limited in size. The larger competitive threat is closer to home in Germany with Frankfurt and Munich airports and hub carrier Lufthansa, which heavily competes not only to Asia but to LOT's other long-haul market, North America (unlike Gulf carriers). Lufthansa's Star Alliance membership means LOT's frequent travellers receive benefits on Lufthansa, making Lufthansa a very palatable travelling options. There is a further competitive element with Lufthansa being able to limit LOT's airline partnerships. Warsaw and LOT must win passengers back from Lufthansa and its German hubs. There is a sense with the Polish public that LOT has abandoned them when in fact much of its withdrawal from markets was part of mandatory compensatory measures in response to LOT's state aid package. LOT has made small cuts from Warsaw. Lufthansa and LOT in recent years have had relatively consistent international capacity from Warsaw to Europe. 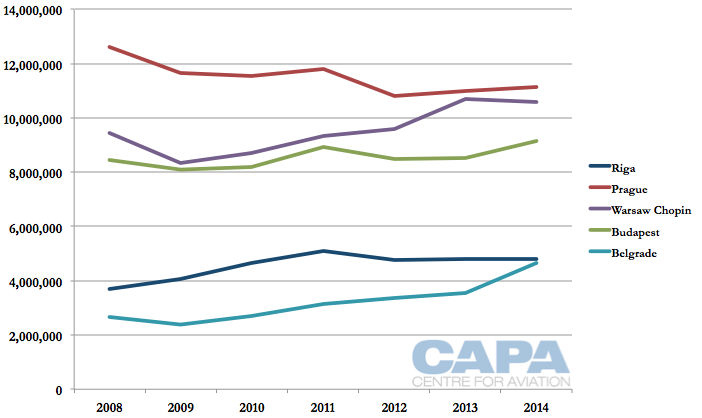 LOT in 2015 is contracting by 3% and Lufthansa by 5%, according to OAG data. The bigger battle is in secondary Polish cities. LOT has had to cut all international services from Polish cities other than Warsaw. This has meant LOT and Lufthansa competing for one-stop traffic from secondary cities to Europe, LOT over Warsaw and Lufthansa over its German hubs. In 2005, LOT and Lufthansa had approximately the same seat capacity from secondary Polish cities to Europe. By 2010 LOT had 54% as many seats from secondary Polish cities to Europe as in 2005, but by 2013 LOT was approximately at 2005 levels. 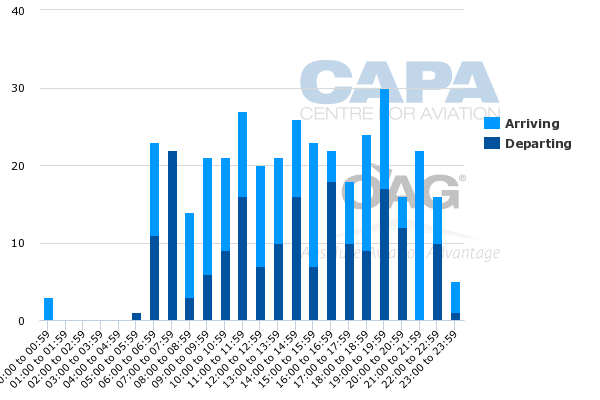 LOT cut all capacity over 2014 and in 2015 has zero European flights from cities other than Warsaw. Between 2008 and 2013, when LOT grew but then contracted back to 2005 levels, Lufthansa grew 37% from secondary Polish cities. In the shorter timeframe between 2013 and 2015, when LOT exited the secondary city market, Lufthansa grew 47%. 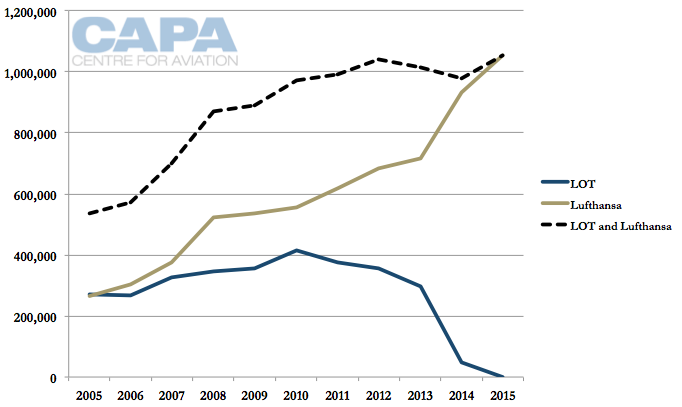 In 2015, Lufthansa's size in the secondary Polish market is about the same size as LOT and Lufthansa were combined in 2012 (black dashed line on the graph below). Modlin is Warsaw's LCC-dedicated airport. Wizz Air and Ryanair moved services from Chopin to Modlin in Jul-2012, although Wizz is now back at Chopin. (Ryanair returned to Chopin briefly while Modlin fixed its runway.) Ryanair remains the only carrier at Modlin. Polish Airports State Enterprise (PPL) owns 100% of Chopin but 30% of Modlin, mitigating some competition between Modlin and Chopin. Warsaw Chopin's 10.6m passengers in 2014 compare to Modlin's 1.7m throughput in 2014. Traffic through the first five months of 2015 is up 60% year-on-year. Modlin operates 24 hours without restrictions. 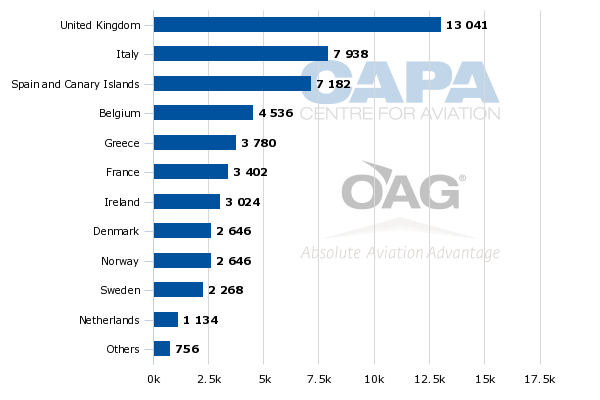 Ryanair – and thus Modlin's – top market by far is the UK followed by Italy and Spain. Poland benefits from having come through the recession relatively unscathed: it never went into recession, the only EU country not to do so. But on other economic measures it varies over and below the EU norm. GDP growth is estimated at approximately 3.5% for 2015 and 2016. The airport expects faster passenger growth of 5-6% annually, with LOT and its new strategy to significantly contribute to growth. This brings Warsaw into the competitive arena along with Vienna, Budapest and Prague as a hub for Central European traffic. On 23-May-2015, Warsaw Frederic Chopin Airport reopened Terminal A following a PLN400 million (USD106 million) refurbishment and extension. The works included additional airline, travel agent and car rental positions and additional office space. The airport has also added a direct connection to the underground railway station. Further investment, relatively proactive, will help Warsaw narrow in on its focus to be a hub.